Question: So Haopee, how many awards did you get before you decided to write this post? First and foremost, I would like to thank each and every single being, human and pet alike who awarded these to me. We have been awarded the Very Inspiring Blogger Award by Brando and Bogart, Dachshund Nola and Alison and Zoe from Pawfect Days. The Illuminating Blogger was given by Carolyn and Austin of Catachresis and Gronk and Izzie. 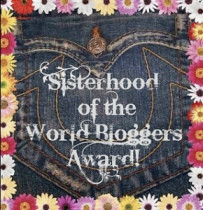 Lastly, the Sisterhood of the World Blogger Award! came from Poppy. 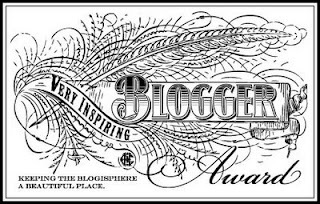 Two blogging awards (namely the Very Inspiring Blogger Award and the Sisterhood of the World Bloggers Award) had the same rules which required us to share 7 things about ourselves and pass it to 15 bloggers. The Illuminating Blogger Award required us to share one interesting fact about ourselves and for it to be forwarded to 5 others. Due to short attention span constraints, we hope no one objects that the 1 fact and 5 bloggers are to be already included in the next segment of this VERY LONG POST. With no further ado, we'd like to present our Creature Feature. 1. Haopee is a creature of coffee. This means that I'm willing to be paid in form of coffee beans and whipped cream. 2. Chooey is a creature of art. 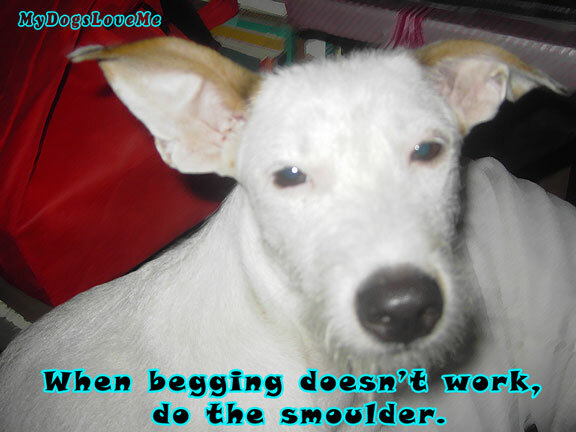 She dances in front of my mom to beg for food. 3. Peanuts is a creature of nature. When she hears commotion outside, she will scratch, whine and look at me hoping I'd let her out. 4. Ginger is a creature of food. She is food driven which means she can learn tricks faster than any of the dogs as long as she's rewarded with food. 5. Coal is a creature of noise. I seriously need to buy a pair of ear plugs. Coal doesn't bark-not once in his entire dog life, he only whines in this high pitched tone. 6. Brother Dog is a creature of fleas. Seriously, he still doesn't want us to touch him- or bathe him for that matter! He is the type who will only come close to his food when the coast is clear. 7. The last person in our creature feature is Haopee's Beau. Yes, you seldom hear about him but he exists. Haopee's Beau is a creature of patience. He puts up with all 6 of us. Now, to distribute these wonderful awards to other bloggers, I would like to name 15 special bloggers who deserve them very much. And due to the fact that you may have receive these awards already, I would like to request that the rules be bent for the awardees to have the freedom to choose which of the three they prefer posting about. One moment...Coffee and Sandwich Break ^_^. Kindly make yourselves at home with Peanuts intermission picture. Any questions? Violent reactions? No? Good! Here, have a cookie! Wow! That is a lot of awards! Congratulations! Thanks for passing on the honour! We've recently gone award-free on our blog, because of a certain lazy...busy...human, but we appreciate it VERY much! 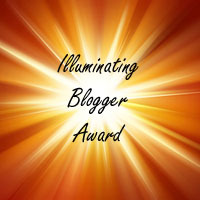 Oh Thank you so much , we chose the Illuminating blogger award, We have had this before so instead of answering the questions we will do a special post. Many thanks for cheering us up on a miserable rainy Monday. Woo hoo! Thank you so much for the awards! And congratulations to you too! Congrats on your award and thanks for passing it on to us. Like you, we tend to delay doing the awards too but we will get to it after we finish out the Blogville Olympics entries. Thanks again! Congrats on all your many awards - some very nice smouldering there! Congrats on all the awards, we are behind on ours too! Wow Haopee! You're one popular pup with all of those awards. Congratulations! And I am not surprised in the least...You guys all deserve awards. Those are some cool ones too. Glad to know more about your mates. Congratulations on all of your awards!!! congrats on all the awards!! sometimes it can be overwhelming, and i forget that i've been given awards, but i dont stress out like i use to about them. You are sitting on top of a major pile of awards. Congratulations! Concatulations on all of your awards! You deserve all of them, and more. Thank you so much for thinking of us! We'll post the new award on Wednesday. We are so happy to have such sweet furriends as you. Congratulations on your awards! It's always nice to see my favorite blogs get recognized. I loved all the little tidbits you shared about you and your pack. And that picture is killing me! Congratulations on all of the fun awards, each of which is very special and much deserved! We loved learning about the type of "creature" each of you is...and discovering their is a secret beau! Congrats on your awards!!! That's so exciting. My assistant is a creature of coffee, too! Congrats. We are so behind on our awards we forgot which ones we received! Bad I know but there is only so much time in the day. Hey! Thanks for thinking of us! Congratulations of getting so many awards! That is great! Our Mom is being rather neglectful of our blog right now, something about "work." We are sure that she is just making excuses. Have a pawsome day! Congratulations on all your Awards! You did a beautiful job in writing this post. Sometimes with "life happening around us,"
its hard to stay on top of things.. This post is beautiful, and you deserves all of the awards! The list of awards which your dog have won are awesome. I think whatever you have tech your dog is awesome and now you are getting award for that. MOWZERS! Concatulations on all your awardies! We laffed at your beau being a creature of patience!